CRYPTO Markets Monday PullbacksteemCreated with Sketch. Happy Monday all! Crypto markets are pulling back after some more indecision and boring market conditions. 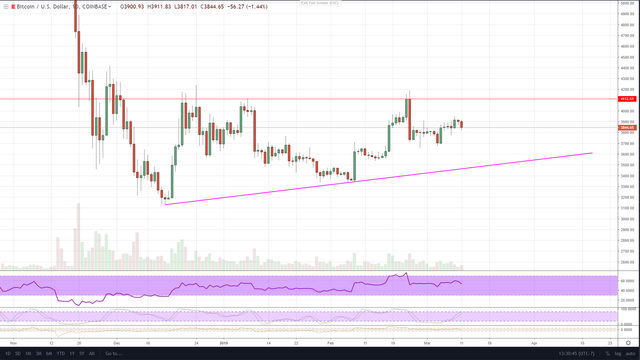 Upper resistance levels still seem to be pretty strong, so hopefully, there can be rising supports to allow bull movements to eventually push up and break these resistances. I am fearful that these moves are nothing more than a bear flag on the longer daily and weekly charts. Volumes overall are just dwindling, so without some great news or something, we will honestly be looking at longer sideways action and then a probable bear pullback like what we saw in November. Nothing really too crazy to be worried about. Positions right now are just boring and sideways. Hope you all had a great weekend! haha indeed. Hopefully it will be soon!! Or, crash a ton so we can all buy a ton more for super cheap, hehe.